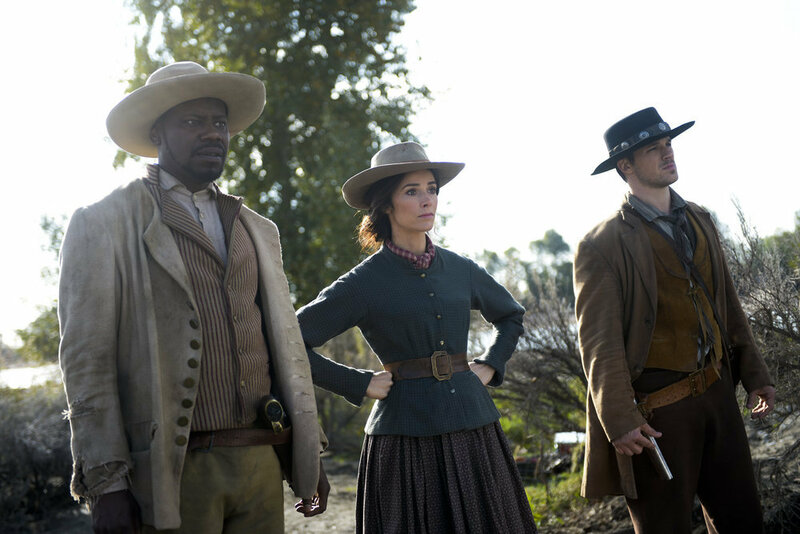 Timeless continues to be one of the most engaging new shows on television, and “The Alamo” proves exactly why. It is the perfect blend of mystery, character development, emotional heart, high-stakes action, and subtle comedy. Oh, and it’s also about traveling through time. I’m surprised by this show because each week, I expect to be tired of time traveling shenanigans. After all, it’s been five episodes and the team still hasn’t been able to remotely stop anything Garcia Flynn is doing. He’s pretty much an unstoppable force and the team chases him from one rabbit hole to another. And yet, the show isn’t tiresome. And it isn’t boring. And it isn’t predictable. Because I think that Timeless knows it has only a tiny amount of wriggle room with its villain — too much of him, and the audience will groan and wonder why the team hasn’t been able to stop and catch him; too little, and it’s basically a show about a misfit team bouncing through time and space. So instead of just providing us with action and drama, the show leverages its plot in order to build its characters. I talked about this last week with the relationship between Wyatt and Lucy, and this week I’ll discuss how Wyatt took center stage in terms of character growth and backstory, culminating in a heartbreaking monologue. But first, I’ll air my few grievances with the episode because they’re few and far between — how did the team take so long to figure out that they should forge the letter asking for reinforcements? And why did it take Rufus the entire episode to remember that they packed grenades with them? The problem I had is that these moments took me out of the story because I figured out something before the characters did. And that kind of storytelling always bothers me a little bit. With that behind us, let’s dive in to the episode! When I first watched the Timeless pilot, the thing that stood out to me most was the character of Wyatt. And the reason, unfortunately, wasn’t great: he was pretty much the stock character of a soldier, with Southern charm and manners. He is always focused on the mission, easily detaches himself from others, and thinks tactically. I was worried that the show wouldn’t be able to provide much depth or story for him apart from that, but I was thankfully wrong. Throughout “The Alamo,” we see Wyatt grapple with flashbacks and PTSD — as gunpowder explodes and Wyatt walks through various parts of the Alamo, he remembers his fellow soldiers. When he breaks down and tells Jim Bowie about the battle that he’s faced, we hear more about why Wyatt is the way that he is, and why this particular battle is the thing triggering him. For one, the battlefield looked a lot like dusty Texas. So it’s understandable that Wyatt is facing trauma. But for another — much larger — reason, Wyatt knows the outcome of the battle at the Alamo. He knows that everyone dies, and he desperately tries to save the men he’s fighting alongside. Because that is, at Wyatt’s core, who he is. Wyatt has honor and integrity and he cannot bear to leave people behind. But, as we learn in this episode, that’s exactly what he had to do in battle. Wyatt tells Bowie his own battle story — that he was fighting alongside men who were outnumbered and surrounded. And Wyatt was the one they chose to survive. The unit had intel that they needed someone to survive in order to pass on, and Wyatt was who they chose. As you might imagine, this haunts Wyatt. He feels survivor’s guilt, especially because his entire unit died and he was awarded a medal for being the one person they chose to survive. So as Wyatt watches the chaos at the Alamo unfold, he cannot help but be sent back to that day — it is his chance, in his mind, to right what went wrong before. With the story of his survivor’s guilt earning Bowie’s trust, Wyatt prepares for battle while Lucy and Rufus prepare to help the women and children escape. But when Lucy returns to get Wyatt, he tells her that he has to stay and fight. It’s a really intense emotional scene and Matt Lanter absolutely sells it. Wyatt feels guilt for living while his fellow friends and soldiers died. He cannot bear to repeat his own history, and to flee again while good men die. It’s this really interesting display of guilt that is kind of manifesting itself in a self-destructive way. Because Wyatt didn’t die fighting before, he feels like he deserves to die now. I kind of wonder if Wyatt went into this final mission ever expecting to actually return home at all. He knew he was fired from the team, and knew how the Alamo ended. It might not be true, but I kind of think that Wyatt mentally prepared himself to die before the team even arrived in the past. And who stops Wyatt from his suicidal guilt absolution mission? Lucy spends a lot of time in the episode trying to protect history by getting it just right. As Wyatt grows frustrated with her obsession over the wording of the letter, Lucy tries and fails multiple times to recall exactly what was in the famous letter that eventually created Texas. But when it comes to giving speeches, Lucy didn’t have writer’s block. She, unbeknownst to Wyatt until he finishes the story, is sitting a few feet away from Wyatt and Bowie as the former tells about what happened to him and his unit in battle. It’s a really emotional moment for both of our main characters, and it helps Lucy understand Wyatt a bit more. Last week, the two got really vulnerable with one another, and this week Lucy uses her emotional connection with Wyatt in order to convince him to come back to the present with them. And make no doubt about it, this moment is very emotional. As bullets are flying above them, Wyatt shields Lucy and tells her that he can’t abandon the men at the Alamo — not again. As Lucy listens, she tries to convince him, desperately, that he is needed. Rufus needs him. The team needs him. But most importantly of all, SHE needs him. In fact, this is what she says: "I don't want anybody else. I trust you. You are the one that I trust. I need you." Abigail Spencer and Matt Lanter knock this moment out of the park, especially as Lucy desperately grasps Wyatt’s face, forcing him to look at her. She cannot do the mission without him. But it’s more than just that, I think. She can’t trust anyone else as deeply as she’s learned to trust Wyatt. Emotional vulnerability forges this kind of connection with the people we’re vulnerable with that nothing else can. And it’s a connection that is not easily severed. Wyatt cares about and protects Lucy; Lucy trusts and needs Wyatt. She cares about him and he cares about her. They make each other better and they make each other stronger. That is what a great partnership is, and Lucy is not about to lose him without fighting with everything she has. When Wyatt is really forced to look Lucy in the eyes and think about what he is losing by staying and fighting, he crumbles and begins to cry. He can’t let her down; he can’t leave her. So he agrees to come back with the team, and heads for the exit. But not before Wyatt has a final conversation with Bowie, in which the man gives him the first Bowie knife. Both men are brave, and both are heroes in their own rights. It’s a really lovely moment and one that, again, Lanter played extremely powerfully. When the team returns to the present, Rufus and Lucy team up against the military official who wants to replace Wyatt and demand that he not be replaced. In fact, they refuse to continue with the mission if anyone else joins the team. With that ultimatum, it’s settled: Wyatt is staying. “The Alamo” was another really solid episode of Timeless in which we got a great glimpse into what affects these characters and what they have gone through that has led them to who they are in the present-day. I look forward to the emotional journey the show will take us on as the season progresses. I actually like the fact that this week’s episode featured Flynn being challenged on what lines he’s willing to cross. When Santa Anna issues a red flag, which means that anyone within The Alamo will be executed, women and children included, Flynn tries to change the general’s mind. It’s an interesting display of compassion, especially from a man who has committed some pretty heinous acts in the name of destroying Rittenhouse. But perhaps it’s because his own wife and child were killed that Flynn has this as his moral line. Either way, it was interesting that he was so adamant about letting civilians survive. Lucy’s speech to Wyatt is still the best thing she’s ever said to him. Lucy now knows the name of her father. What is it? DUN DUN DUNNNNNNNN. What did you all think of this week’s Timeless? Sound off in the comments below!